Hugely characterful multi roomed inn not far from the cathedral, brim full of seemingly random artefacts including much of the seating. There were several ales from small breweries, and the Triple fff was extremely pleasant. Very quiet of a Tuesday lunchtime. After a nice walk along the River Itchen we had a pint here,this place would keep Tim Wonnacott out of mischief for hours,so much bric-a-brac to look at Giraffes necks,Elephant feet,whole seagull (no the menu is a tad boring),medicine cabinets books etc.It is worth a visit to Winchester just to see this pub,it is close to the Cathedral.The beer was very good. Couldn't agree more with previous posters, stunning ambience, good beers. I had Itchen Valley Watercress and Red Cat Prowler Pale - both good. Sandwiches looked good and treats for the dog - not sure what he made of the stuffed giraffe where we were sitting though. Bit of a trek from the station but well worth it. Consistently excellent, decent ales with chatty staff and barfly's usually. All sorts of junk on every surface, and hours worth of graffiti in the gents loos, not recommended for PC types for sure! 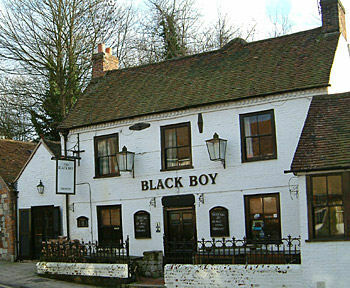 I returned to Winchester and found The Black Boy was my favourite new pub of the day. It doesn't quite match my visit to the Hyde Tavern a few years back. But The Black Boy is almost as good. 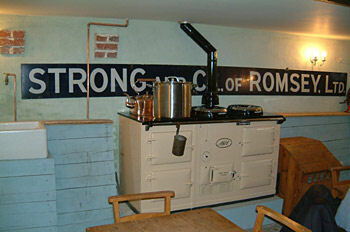 It has low beamed ceilings with lots of little rooms and all sorts of paraphernalia, including upside down Christmas trees hanging from the ceiling and stuffed warthogs. There was a table football table in the room I sat in and there was also an impressive outdoor courtyard. Situated just out of town, it is near a pleasant weir on the River Itchen. Customers were mainly couples and families. For some reason I was expecting more ales. But I was surprised to see an American cask ale - Napa Smith Pale Ale. They also had Bowman Swift One & Cardinal, Flowerpots Bitter & Hopback Summer Lightning. Ciders all appeared to be from Lilleys - Mango Cider & Sunset on handpull and 3 others on keg. This place is well worth a visit.